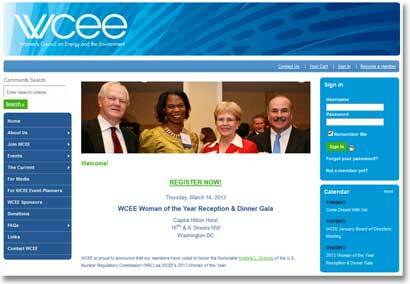 The Women's Council on Energy and the Environment provides a nonpartisan and policy neutral forum for dialogue on energy and environmental issues, and to fosters the professional growth of its members. A custom MSSQL (Microsoft SQL Database) Webzine, that includes Web 2.0 features/style. This custom CMS was written especially for WCEE. Articles are searchable, and the webzine itself is organized as a monthly release to replace an online PDF based newsletter. The webzine is administered by a committee of volunteers.